I first learned of the Hearst Hacienda after watching a 2009 episode of Huell Howser's Road Trip series about Mission San Antonio de Padua at Fort Hunter-Liggett in eastern Monterey County https://blogs.chapman.edu/huell-howser-archives/2009/09/30/fort-hunter-liggett-road-trip-with-huell-howser-147/. 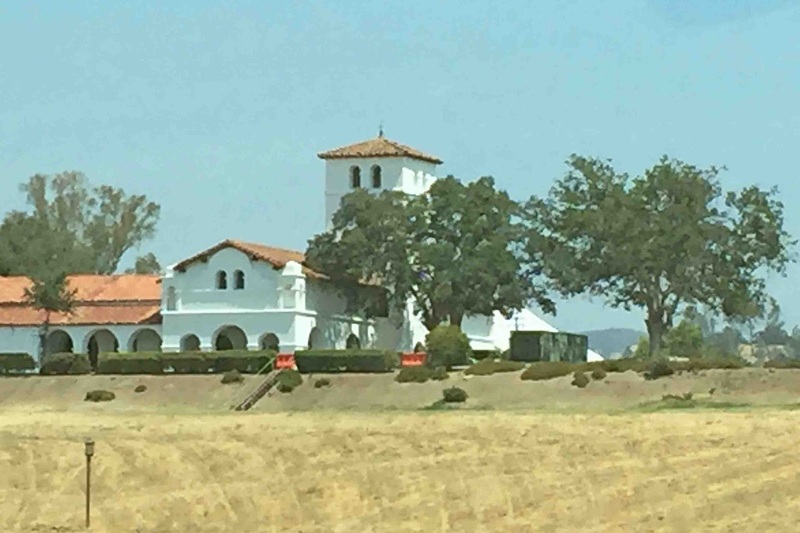 The Hacienda is the current name for a hotel in Monterey County, California, that was completed in 1930 for use by William Randolph Hearst as temporary housing for his employees and guests and headquarters for activities taking place on the surrounding land. The lodge building, designed by architect Julia Morgan, replaced and expanded upon an earlier wooden structure known as the Milpitas Ranch House which was destroyed by fire in the 1920s. 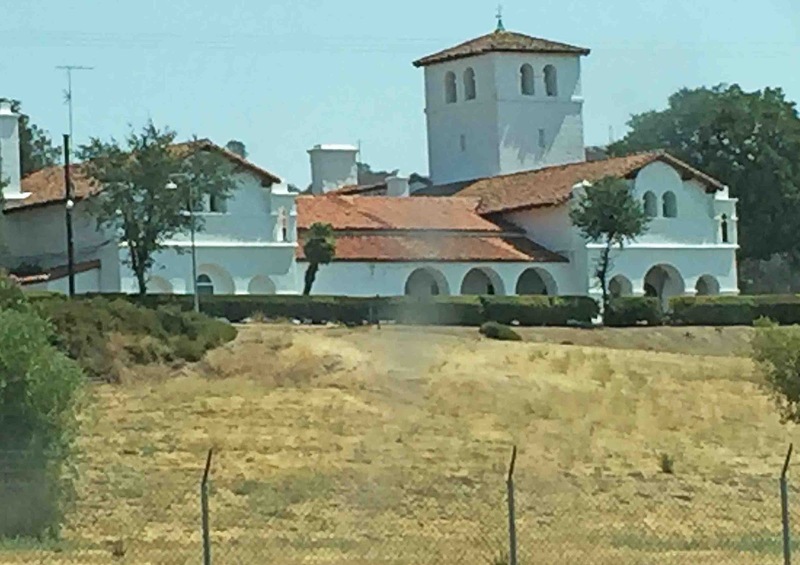 The 1930 hotel has also been known as Milpitas Hacienda, Hacienda Guest Lodge and Milpitas Ranchhouse, under which name the property was placed in the National Register of Historic Places on December 2, 1977. The lodge includes a restaurant, a lounge, a cantina, offices, public assembly rooms, guest rooms, a swimming pool and a tennis court. Hearst sold the structure and its surrounding property to the United States Army in 1940 for use as a training facility. 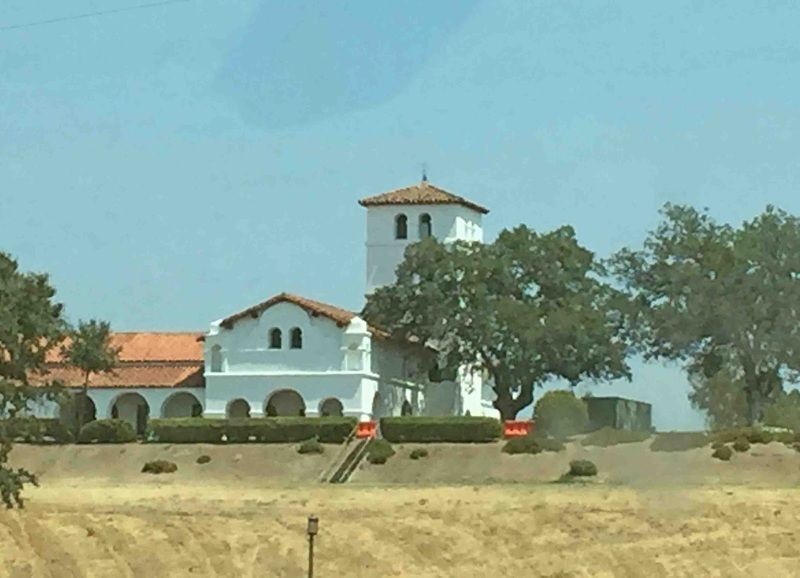 The land and buildings were established by the Army as Fort Hunter Liggett. Today, the Army owns the building and a concessionaire operates it as a public hotel within the military base. 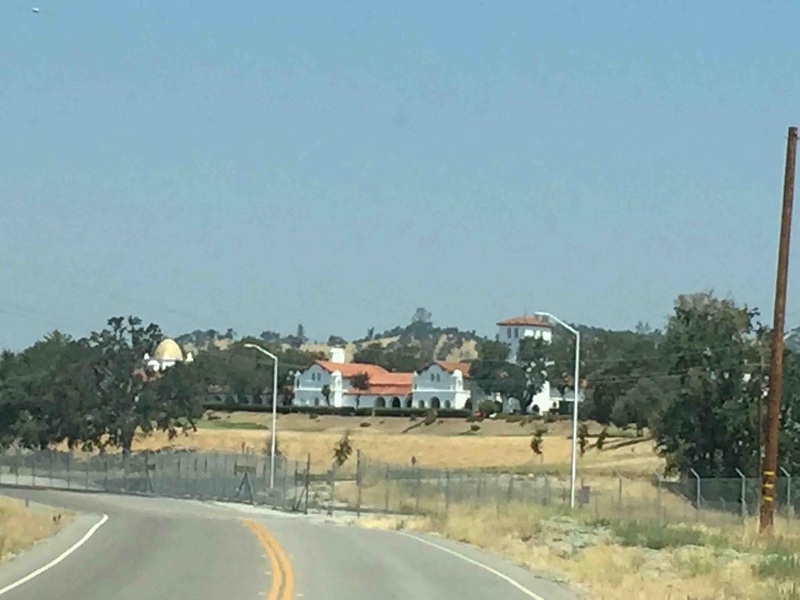 In his program, Huell noted that he initially mistook the Hacienda for the Mission San Antonio de Padua, which is about a mile further up the road. This apparently happened quite often with first-time visitors looking for the Mission, so the golden Moorish dome was meant to signal, hey - this here ain't no Catholic mission! 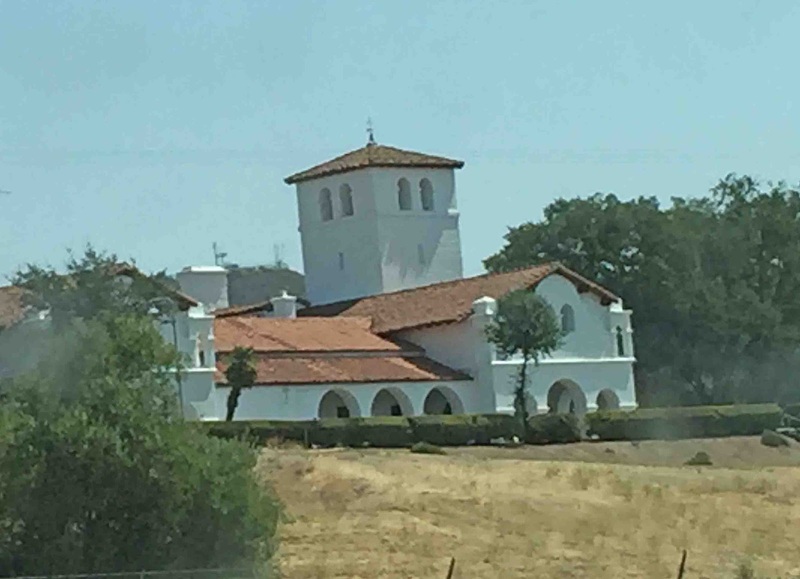 We didn't stop at the Hacienda on this particular trip (8/10/17) since we were en route to see the mission, but I've earmarked this location for a future more in-depth visit or perhaps even an overnight stay. 8/10/17 The golden Moorish dome is visible to the left. From Paso Robles, head north on Hwy. 101 for 20 miles and exit Jolon Road (G18) and head west towards Fort Hunter Liggett. Continue another 20 miles (along which G18 will eventually turn into G14) and then turn left on Mission Road. Continue another 5.7 miles and then turn right to Hearst Hacienda Courtyard. Note: There is currently (as of August 2017) no checkpoint for vehicles entering Fort Hunter Liggett on Mission Road to the Hacienda and Mission San Antonio de Padua. Cowboy Rooms - $50/night 4 rooms with queen-size beds. 1 room with twin beds. Shared bathroom and shower. Garden Rooms - $75/night Queen size bed and private bathroom. Tower Rooms - $90/night Queen size bed and full size sofa bed with private bathroom. Mini Suite - $95/night Queen size bed and full size sofa bed with private bathroom. Upper Commander's Suite - $150/night 2 bedrooms with 1 queen size bed, 1 king size bed, full kitchen, full bathroom, and living room with working fireplace.